Need for speed - Pacific White Sided Dolphin, British Columbia. 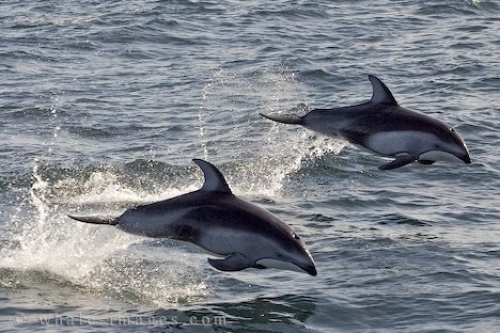 Pacific White Sided Dolphins definitely have a need for speed. They will chase any boat no matter how quick the boat is traveling and try and keep up as long as possible. I shot this picture of two synchronized dolphins with a need for speed as they shot clear of the water during their travels to keep up with us. They traveled in this manner as though they were racing against each other.